Unique in perspective, this book offers a comprehensive values-based approach to professional ethics that is sensitive to the primary ethical issues of the workplace and that offers a positive way for dealing with these issues. 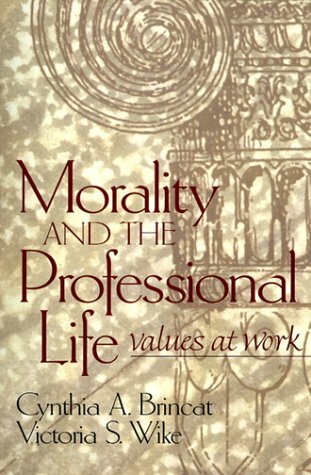 It focuses on values important to all professionals and on how people do their work, not what type of work they do, and recognizes the strengths of various moral theories and the ways to harmonize as many moral values as possible. Readings (from literature, philosophy, and the professional ethics canon), exercises, and cases offer numerous opportunities for practice in interpreting values and applying them to the workplace. MORALITY AND THE PROFESSIONAL LIFE. What Professions and Professionals Are. What Morality Is. What Professional Ethics Is. Moral Reasons and Explanations. Moral Theories. Moral Analysis and Case Solving. VALUES AT WORK. Integrity. Respect for Persons. Justice. Compassion. Beneficence and Nonmaleficence. Responsibility. For all professionals.